Crisp snowflakes and Art Deco glamour adorn this elegant wintery style. Colors are frosty aqua and white with rich golden accents. A subtle geometric pattern watermarks the background behind scattered snowflakes. Topped off with charming fonts, Snowflake Policy brings plenty of pizazz to the season. Print this style on our pearlescent paper to add an iridescent sparkle to the snowy feel. 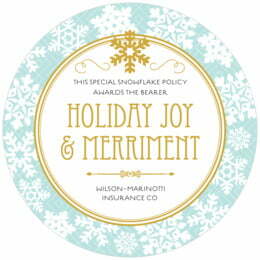 Customize your Snowflake Policy holiday coasters today! Snowflake Policy holiday coasters are available in several shapes—3.9" round, 3.9" square with rounded corners, and others. They are printed on extra-thick (58-point) paper board. To give you an idea of how thick they are, a stack of a dozen coasters are around 3/4" tall. 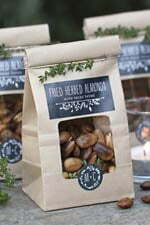 They are made of absorbent pulpboard to help protect your tabletop. The coaster top is coated with a smooth matte coating to provide beautiful, crisp printing. Holiday coasters are individually die-cut, so their top has a soft and rounded edge. They are designed to be disposable, but they are durable and re-usable. If unused, they can be kept as keepsakes and will last forever. Holiday coasters are printed on one side only. On the blank back, a small Evermine logo is tastefully debossed. Holiday coasters come beautifully packaged in boxed sets of a dozen; they are great to give as a gift for the host and hostess when you attend a holiday party elsewhere, or if you are the host, hand them out to your guests or scatter them on your tabletops. 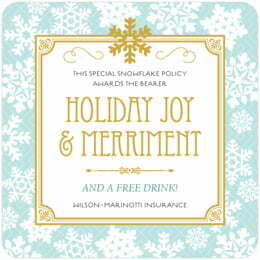 Choose a desired color and then select "Personalize" to start customizing your Snowflake Policy holiday coasters today!